The wicked walk under God's constant curse. But Godly lovers walk under a stream of his blessing for they seek to do what is right. Your're blessed when you meet Lady Wisdom, when you make friends with Madame Insight. He strengthens the bar of your gates and blesses your people within you. Yes! He will bless his lovers who bow before him, no matter who they are. Praise the LORD! Blessed is the man who fears the LORD, Who delights greatly in His commandments. God always blesses those who are kind to the poor and helpless. They're the first ones God helps when they find themselves in any trouble. 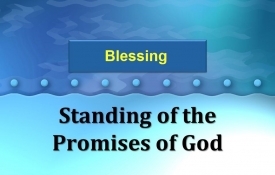 Blessed is the one who trusts in the Lord, who does not look to the proud, to those who turn aside to false gods. For those blessed by Him shall inherit the earth, But those cursed by Hin shall be cut off. For those blessed by Him shall inherit the earth, But those cursed by Him shall be cut off. You prepare a feast for me in the presence of my enemies. You honor me by anointing my head with oil. My cup overflows with blessings.